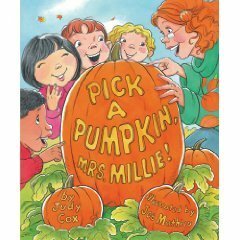 Judy Cox - Pick a Pumpkin, Mrs. Millie! Click to buy this book! In the fall, Mrs. Millie takes her kindergartners on a class trip to pick pumpkins for their harvest party. The class has fun guessing the meanings of their favorite teacher's nonsense words. They go on a dragon (wagon) rige, see a harecrow (scarecrow), pet the boats (goats) and drink apple spider (cider). What a pun-filled day! TIME magazine Best Children's Books of 2009.